PLEASE NOTE THAT PROPS HAVE BEEN USED TO DISPLAY THIS WATCH CHAIN. 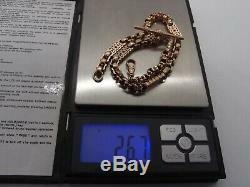 The item for sale is a lovely VICTORIAN 9ct YELLOW gold. Made up of alternate filigree box links. Often referred to as stars and bars. Joined via etched belcher links. 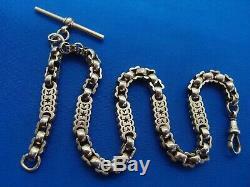 THIS ALBERT CHAIN IS LONG ENOUGH TO BE. 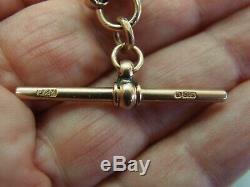 A VICTORIAN/EDWARDIAN HALLMARKED SOLID 9ct YELLOW GOLD ALBERT POCKET WATCH CHAIN STARS & BARS TYPE LINKS. OF SOLID AND ROBUST CONSTRUCTION AND A GOOD HEAVY WEIGHT AT OVER 26 GRAMS. 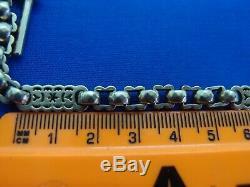 STARS & BARS LINKS ON THE CHAIN ARE JUST OVER 6.0 mm wide IMAGE 10. 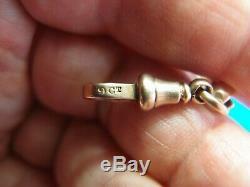 TYPICAL VICTORIAN HALLMARKING ON LAST BELCHER LINK ON MAIN CHAIN. 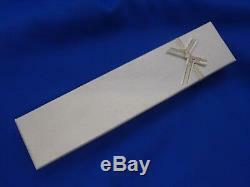 THIS LINK IS STAMPED 9cIMAGE 9. MAKER P & M STAMPED on THE T BAR. 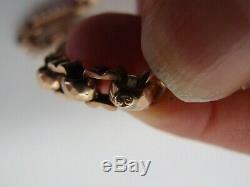 A NICE MATURE SHADE OF ANTIQUE 9ct yellow GOLD. 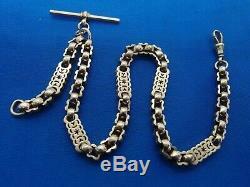 IN VERY GOOD CONDITION FOR A GENUINE VICTORIAN/EDWARDIAN ERA ALBERT POCKET WATCH CHAIN. LOOKS LIKE A VERY OLD SOLDER REPAIR TO THE T BAR. ONE BELCHER LINK HAS A VERY SMALL DING. 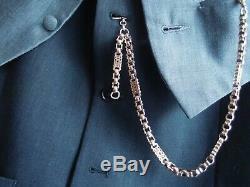 CONSIDERING THE EXTREME AGE OF THE POCKET WATCH CHAIN IT IS IN VERY GOOD CONDITION. FOR A GENUINE ANTIQUE PIECE. WEAR AT A WEDDING ON YOUR WAISTCOAT OR GIVE AS NICE PRESENT FOR SOME SPECIAL PERSON. Please study all photographs VERY, VERY carefully since they form part of the description. 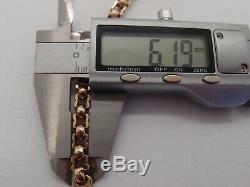 Dimensions & Weight -LENGTH OF MAIN CHAIN 11.5 INS OR 29 CM (INCLUDING DOG CLIP). The TOTAL weight is 26.7 GRAMS. 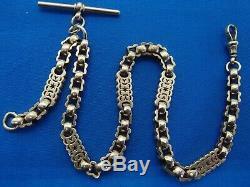 FOB CHAIN 50 mm //2 INCHES LONG. PLEASE NOTE ALL DIMENSIONS ARE APPROX. 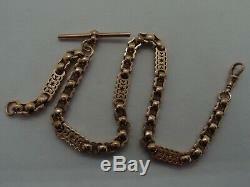 SEARCH ENGINE: victorian edwardian 9ct gold albert chain watch chain BIRMINGHAM ENGLAND assay office NOT ENGRAVED 1920s 1930S pre war pre world war two art deco era period. The item "HANDSOME VICTORIAN FANCY STARS & BARS 9ct GOLD ALBERT POCKET WATCH CHAIN 26.7g" is in sale since Monday, March 25, 2019. This item is in the category "Jewellery & Watches\Vintage & Antique Jewellery\Vintage Fine Jewellery\Victorian (1837-1901)". The seller is "pitcherking2" and is located in LANCASHIRE ENGLAND. This item can be shipped to United Kingdom.